Inbound marketing has become increasingly popular among B2B companies because it helps them drive quality leads and close more sales. We love inbound marketing at Accelity, and we’ve seen great results from it, both internally and when working with our clients. 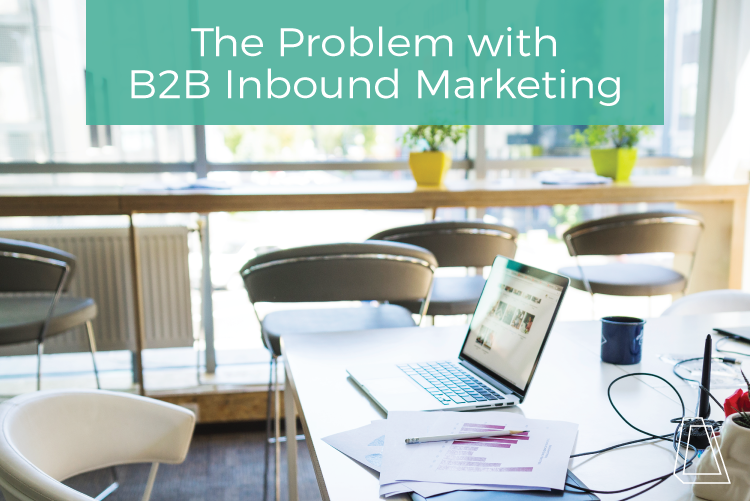 However, B2B inbound marketing isn’t a perfect system, and may not be a fit for everyone. That’s why I’m walking through the problems we’ve found when implementing inbound marketing. Some B2B companies (especially startups and small businesses) don’t have the resources to commit to the above steps. The good news is that many third party inbound marketing experts have implementation and continued execution of B2B inbound marketing campaigns down to a science, and are affordable even for small businesses. If you’re intimidated by the time commitment, you can start small (there are no hard and fast rules to the size of your inbound campaign). Just remember to test your results; doing this will help you justify your decision to further explore this strategy. The goal of inbound marketing is to attract and nurture new quality leads and convert them into customers, and this strategy isn’t always cheap. Remember, the cost for acquiring a new customer is 5-10x more expensive than retaining and upselling an existing one. If your purse strings are tight, you might want to explore other marketing options, like creating marketing campaigns that upsell or cross-sell to existing customers. Inbound leads are higher quality, so it takes time to ramp up your strategy and nurture them so that they hit qualified status. You need to stick to your strategy to see results. Running sporadic monthly campaigns is fine, but it won’t produce consistent qualified lead conversion rates. If you don’t have the resources or time to dedicate to monthly campaigns, then B2B inbound marketing may not be ideal for you. As I’ve said above, you can start small if you don’t have the capacity to build a complete inbound campaign. Try creating one blog, instead of three, to promote your offer, or post on social, but don’t promote via paid ads. Tweaking your process is okay, as long as you stay consistent over time. Another thing to note is that you shouldn’t completely abandon other marketing practices. Inbound and outbound strategies work well together, so consider using both (it’s not an either/or choice). B2B inbound marketing is a powerful strategy, but every business owner and marketer should be realistic about the commitment and the time it takes to see results. Inbound isn’t for everyone, but if you choose to dedicate time and resources to it, you’ll see positive long-term outcomes. If you’re curious about how to get started with inbound marketing, reach out to us here. Do you agree or disagree with my thoughts on inbound? Share with me in the comments below.